My career as a civil servant has me constantly reviewing documents for spelling, grammar, logical flow, and format. Finding a good recipe also requires the instructions to be clear and complete -- so that your reader can easily follow the instructions. A couple of weekends ago, Meredith asked me to make her a curry for supper. Since there weren't any boneless-skinless chicken breasts at the grocery store, I decided to buy some ground turkey and look up a meatball curry recipe. What I found looked good at first, but was lacking. The ingredients weren't in the correct order or separated for different parts of the recipe, and some ingredients in the instructions were missing from the ingredients list altogether. In addition, the recipe called for a kilo of beef, and I had 1/2 kilo of turkey (much leaner). I re-wrote the recipe, adjusting quantities and other things to make it my own. For all the editing I've been doing at work, this gave me the bigger sense of accomplishment. Maybe I should re-visit some earlier posts and make sure those recipes flow. This curry is a great way to serve meatballs. 1. Combine the ingredients for the meatballs and mix evenly; form into equal-sized balls and set aside.2. Heat oil on medium and fry onions for 5-8 minutes. Add garlic and ginger and fry for an additional 2-3 minutes. Add coriander, garam masala, cumin, turmeric and tomatoes, stirring occasionally and fry until oil begins to separate.3. Add water and bring mixture to a boil. Reduce heat to medium-low and gently add meatballs.4. Cover and let simmer for 5-7 minutes, then gently stir mixture. 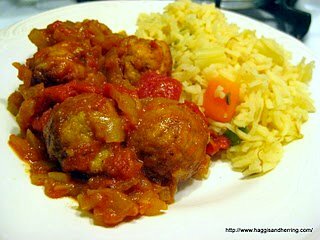 Continue to let mixture simmer, uncovered until the sauce reduces and the meatballs are fully cooked.Serve with basmati rice.